Last night's storm cleansed the air. The heaviness on my chest has eased. Yesterday I resisted the temptation to deploy either albuterol or nitroglycerin, pressed by some inner instinct, perhaps my body's barometer. When the first lightening flashed, Jessica and I looked at each other with some keen mixture of wonderment and confirmation: Here it comes. The hammering rain started moments later. The storm intruded on my sleep, calling troubled images to rise from the murks where they linger during daylight hours. On waking I paced around the room, flexing cramped calves, lamenting choices that inevitably drew me to this moment in time, this configuration of events. I fell back asleep before dawn and awakened, tense and knotted, at ten past seven. 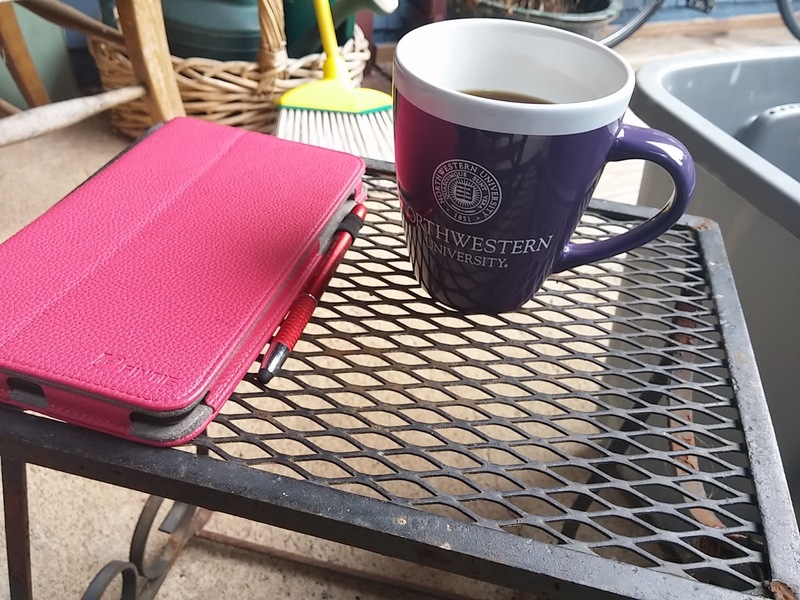 Now I am on the porch where I have been for two hours, with only a cup of coffee for protection. That I am in my nightgown reminds me of my grandmother Johanna Ulz Lyons, who sat on the patio of the home that she and her husband, my grandfather Delmar Lyons, built in a new subdivision south of Springfield, Illinois. She always wore her full slip. She said one of the benefits of home ownership was the right to do as you pleased in your home but she waited until the sun sank on the other side of the house before she went outside, with her cigarettes and a drink. I raise my coffee and feel the line of my arm. My eyes close; I deliberately hold them shut, and hear the clink of the ice in Nana's drink. What, Nana? I ask, and I am ten; I am eleven; I am eight. I am the child formerly known as Mary, and I am spending the summer with my Nana before I start fourth grade. I know there will be shoes. I heard my mother talking in the living room before she left to return to St. Louis. "She needs shoes, she always needs shoes." I scuff one foot over the other. The heat rises in my face. I know how much trouble I am; I assume I cost my mother a lot of money because I don't walk right and I have to go to the doctor a lot. I hear Nana's reassuring voice. I know there will be a trip to the shoe store next to the Sonotone House of Hearing, my grandparents' hearing aid business. I go out of the kitchen and stand on the patio. The corn rises high and heavy in the field next to their house. My grandfather keeps the neighborhood children out of the crop in exchange for the right to unlimited ears of the sweet corn. We eat it with slathers of butter, melted butter that runs down our chins and drips on our T-shirts. After my mother leaves, my brother Mark lures me down to a creek at the end of the dirt path beyond the subdivision. He shows me crawdads. I slip in the mud and land on my bottom. I don't mind; the sun shines on my face as I tilt my body backwards and let my foot-long braids dangling in the brownness of the trickling water. I know my grandmother won't scold me for being dirty. She'll just toss my clothes in the washer and snuggle me into a nightgown, then we'll say prayers and I will fall asleep on the sofa bed in the den. My brother took the guest bedroom but I don't care; I like the fold-out mattress, the stack of books on the side-table, and the reassuringly small confines of the room with its solid closet and thick carpet. I listen to the night noises through the window and think about turning nine. Back home in Jennings, I worry about starting fourth grade while I'm trying to sleep, but here in Chatham, the start of the school year seems distant and unthreatening. I hear Nana and Grandpa moving through the hallway. My door has been closed except an inch or two; the hall light shines bright enough for me to find the bathroom if I need it. My brother, two years older, has a later bedtime than I do but I don't care about that, either, for the solitude of the little den comforts me. I spend most of my evenings reading even before we pull out the sofa bed and straighten the sheets. On Monday morning, I go into work with Nana and sure enough, we go next door to the shoe store. She buys me a pair of Bass Weejun penny loafers and a pair of saddle shoes with solid ties. 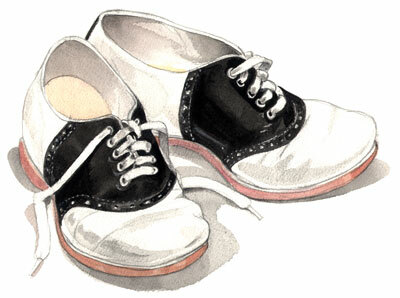 I suppress my dislike of the saddle shoes, which I know I have to wear because of how I walk. She tells me to save the penny loafers for Mass on Sunday and to wear the saddle shoes to school, but she lets me wear the loafers from the store, and slips bright shiny pennies into the slots. Then she takes me to Strong's for lunch and I have stewed chicken and blueberry muffins with honey butter. My chest tightens after lunch; we walk that off. No one has yet figured out that I'm allergic to honey. We think I have eaten too much and the walk back to the office will ease the sensation. I hold my grandmother's hand. When we get to the crosswalk, she says, "Put your best foot forward, Mary." I ask her, "Which one is my best foot?" and she smiles down at me. "Why, the one which is going first, of course." And we step into the intersection, me in my plaid shorts, my T-shirt, and my new penny loafers; she in her crisp cotton dress and a pair of beige pumps. The lunch time crowd of businessmen and office workers flows around us. In that very moment, I am perfectly content with every speck of my world, and I don't even notice the pain in my legs, or the limp, or the stares of people. For all I know, they could be admiring in my beautiful grandmother, and I would not blame them one iota. I see that nine o'clock has come and slipped away. In three hours, I have to be at my office to meet the Google Fiber installer; in three days, I have Trial Three of Four that were scheduled for this two-week period. Trial one got continued; trial two settled; trial four will be relatively painless. But in trial three, all hell will break loose. A mother and a father will be tempted to spend hours on the witness stand hurdling accusations at one another, with three lawyers riding herd on the testimony, and a judge ferreting through the emotions to find the facts. My heart sits heavy at the prospect. I plan to try to stench the blood flow as much as humanly possible, and direct it towards healing rather than more pain. Last night's storm brought to mind the closing scene of The Glass Menagerie. Laura, the daughter, leans down to extinguish the candelabra with which she and her gentleman caller have lit the room when the electricity has failed. Her brother, stage right, watches her from a place distant in both geography and time. He laments her simple fragility, and his own inability to protect her. He tells us of his flight away from home and the sadness of his mother and his sister, whom he cannot escape. I would have stopped, but I was pursued by something. It always came upon me unawares, taking me altogether by surprise. Perhaps it was a familiar bit of music. Perhaps it was only a piece of transparent glass. Perhaps I am walking along a street at night, in some strange city, before I have found companions. I pass the lighted window of a shop where perfume is sold. The window is filled with pieces of colored glass, tiny transparent bottles in delicate colors, like bits of a shattered rainbow. Oh, Laura, Laura, I tried to leave you behind me, but I am more faithful than I intended to be ! I reach for a cigarette, I cross the street, I run into the movies or a bar, I buy a drink, I speak to the nearest stranger -anything that can blow your candles out ! The east shines with the risen sun. Coffee at my side, paper skimmed and tossed in the recycle box, I sit in my old rocker listening to the call of the crow in the maple. I lingered over-long asleep today, whether from the effects of the anti-viral or just exhaustion, I cannot say. But eight o'clock drew near before I lurched down to the kitchen and now an hour has lapsed. A jet slices the sky with its wake of noise; a strange bird whose song I cannot place chirps in the gutter above me. I passed a milestone this week, the thirtieth year since my mother's death. But I also seem to have stepped beyond some point that I had not seen coming, the point at which my emotions dropped jagged to a harrowing depth and began their climb back to the soft expanse above me. I can't say how it happened because I did not see it coming. On my trip to California, I experienced three aggravating falls when the trunk of my rental car flew into my face and knocked me backward. The first time this happened, I lay on the parking lot for an eternity, wondering what I could grab to hoist myself upright. The second time, the hotel owner stood near and instantly lifted me from the pavement. On the third occasion, a young desk clerk did the same. But that first time, outside Room 102 of the Stanford Motor Inn, I lay for some moments caught in the sensation of eternity, of falls suffered, of other ground beneath my back. Our driveway in Jasper, Arkansas. 1988. I've parked the Buick Century wagon and Chester has gone into the house with a grey cloud over his head. We argued on the way down the mountain; not a serious argument, but one tainted with unspoken burdens -- his joblessness, my yearning to return to the city, the lure of his land on Reynolds Mountain where we've begun to build a road but on which we cannot afford to build a home. I sit in the silence of the vehicle. I think about going into the house and calling my father. I run one finger around the steering wheel and gaze out the window, seeing the large yard, the sheltering hedge, the roof of the building beyond our rented property. Through the passenger window, I see the separate entrance in our home which leads to the little room where I'm trying to have a law practice, in a town of six hundred which already has four lawyers. I lay my head against the headrest and close my eyes. I try to remember why we came to this place, why we left Kansas City for Little Rock and then came Northwest, to the mouth of the Buffalo River and the little town which serves as Newton County's seat of government. I feel certain that it seemed like a good idea when we were packing, but sitting in the driveway, in my blue Buick, amidst the lingering simmer of my husband's anger, I cannot recall any of the arguments on the pro side of the debate. I get out of the car and close the door. Then I see my pocketbook sitting on the floor and reach for the door handle, pulling it towards me -- and I go flying backwards, landing flat on my back in the grass, holding the handle, lying, unable to move, with the keenness of the cloudless sky above me. I hear the door to the house slam open and the thud of Chester's boots on the driveway. Then I feel him lift me, feel his hands beneath my body and the warmth of him as he sets me on my feet. We stand, facing one another for a few seconds and then I hold out my hand which still clutches the door handle. "How could this just come off?" I ask him. He looks down, and then, reaching out, uncurls my stiffened fingers and gently removes the piece of broken plastic from my clutch. He gazes at me, raises one hand to brush my hair from my face and replies, "Accumulated stress." And then we go into the house together. Now, here, in this place far from those Ozark mountains, I have relived that moment. I greet the neighbor's house-guest who strolls down the driveway en route to the sidewalk and reach for my coffee, draining the cooled liquid. I raise my hand to feel the lump on the back of my head which I got when I fell in the bedroom on the evening before I left for California, the injury which those three parking lot falls inhibited from healing. I cross one foot over the other and rock the chair -- the chair which I rescued from the trash so many years ago, when a law school classmate packed for her return to the East Coast and could not fit this last item in her U-Haul trailer. Cars drive by, the noise which they make signalling that the drivers have ignored the speed limit. I hear a train whistle, faint and long; a siren, closer; and the birds in my maple -- always, the birds. My friend Brenda walks by on her way to yoga class, calling my name, lifting her arm in a cheerful wave. I sing out in reply: Good morning! Did you get your brother to the airport? Off to Yoga?, and then she is past, yoga mat shouldered on one side, arms swinging, shoulders set. I think about getting another cup of coffee; about going to the Y; about cleaning the house. But for a moment, I just sit and breathe. --- for it is still morning, where I am. 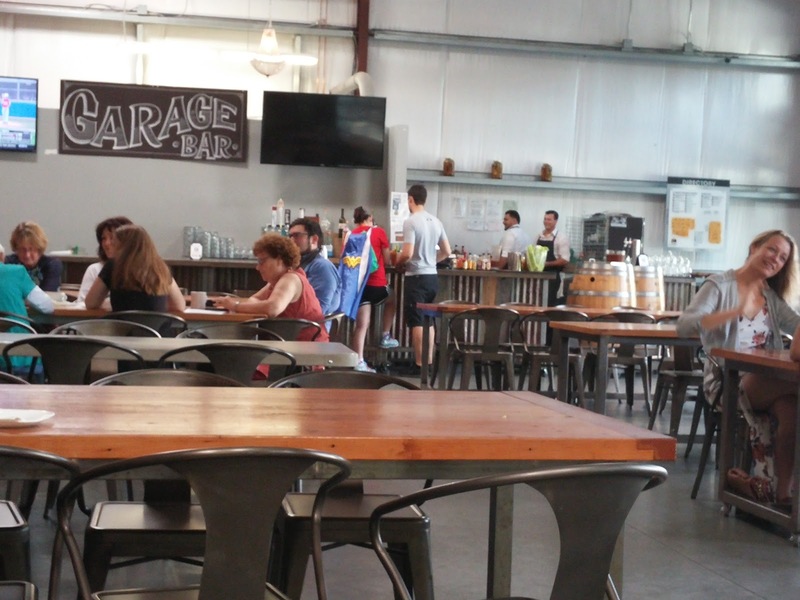 To be precise, I write from the table of B2 coffee (in the same hangar with the Garage Bar), in San Pedro Square Market, San Jose, California. As I start to write, the clock in the lower right hand corner of my computer creeps near 12:30 p.m. but I know that it still measures in Central Daylight Savings Time. My phone and my tablet automatically adjusted to California, just as I have done. I've geared myself down to the slow, smiling way of life without any sign that the adjustment challenged me. A woman passes in front of me carrying a backpack and a motorcycle helmet. A group of what can only be more obvious tourists than I am congregate at tables in one of the wide open doorways. To the right of them, a computer has been plugged into an outlet on the wall, its owner moved away to stand in line seemingly without regard for any mishap which could befall his electronics. Thumping emanates from speakers above me, but not unpleasantly. A woman in a cape orders something from the clean-cut bartender; tacos, I think, or at the very least, tortillas. Something involving a griddle. I realized as I left "Palo Alto's best breakfast spot" an hour ago that I have seen nothing of San Jose itself in my three trips here. So I headed south on Highway 101 with my GPS lady guiding me, burning battery and megabytes to bring me to downtown San Jose. 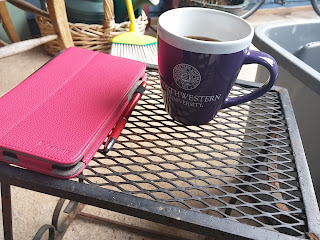 I encountered a closed street and got hand-signals from a smiling police officer; I pulled over and revised my request of the Google goddess: Coffee. She brought me to this place. Despite usual traffic you will reach your destination in three minutes. I did. Yesterday's odyssey at the Stanford Neuro-science Diagnostic Center and Clinic gave me two lovely bruises on my inner calves and high above, next to my left knee, the last of those in the shape of the doctor's strong thumb. I lay on the table while he used the EMG needle to probe my muscle. Listen to that! he called to the Fellow who attended him. He cast his dark eyes backwards to meet my own pale and apprehensive blue ones. Do you hear that noise? I nodded, unable to speak, unsure of the noise's import. Move your foot, please. The noise became thunderous. Ahhhh, yes! He looked again at the little Fellow, whose slight, neat body stood near my elbow. He had our attention. What is it, I finally asked. He laughed but not particularly unpleasantly. He spoke more for the Fellow's benefit than for mine when he said, That's the spasticity! I felt as though I had risen to some occasion, gotten on my finest dress, and paraded in front of them. I've never been particularly pleased with the awkwardness of my gait, with the buckling and shuddering or the waves of burning pain. But this man needed me, needed my "profound dysfunction" to teach the younger man what he wanted him to know about people with weird CNS deficits that might -- emphasis on the uncertainty, informed consent, full disclosure -- benefit from EMG-directed, muscle-specific, minutely calculated injections of poison. I asked, what is it supposed to sound like? and the doctor rewarded me with his stunning, practiced smile. Silence, he replied. In repose, it's supposed to be virtually silent. He nodded at the other man, the student, as though to emphasize the delicious tyranny of my post-encephalitic musculature. Then, with a gentleness that I could not have predicted, this doctor whose patients come from as far away as India to submit to his needle, lifted my small, tired frame from the treatment table and held me steady until I could slide to the floor. An hour later, I found a restaurant where I picked through tortellini drenched in cream sauce to find the chunks of carrot, zucchini and cauliflower. In another hour, I pulled into the parking lot outside Room 102 of the Stanford Motor Inn, weary from the eight hours of being poked and prodded, of waiting, of delicately pushing the pre-authorization ladies to get my insurance company to allow the treatment while I was here, this trip, this time, instead of in six months. Though they did not manage the task, their clinic manager persuaded Stanford Medical Center's billing office to waive the cost of the treatment if the authorization did not come, a kindness that I could not have predicted and which would have been impossible had I not kept my cool. But I did; and it happened; and now we wait to see what if any impact this treatment has on my journey to my personal goal of 103 years on earth without succumbing to the need to sit on wheels. I board a plane in a few hours. I've learned a lot during my week here. In Palo Alto, people whose native tongue varies widely from my own provided moments of clarity about the delights of the American way of life. On the coast, at the Pigeon Point Lighthouse, a retired civil litigator taught me the names of stars and, by inverse example, the virtues of graciousness. On a concrete flight of stairs leading to Whalers Cove, a massage therapist from Fremont showed me an abalone shell, and some native plants, and, gesturing, the far span of her gaze towards the smooth contours of the cove and beyond it, to the ocean. Here in San Jose, I've seen a baby on its father's lap, a woman in fuchsia with her iPhone corded to her delicate ears, a grizzled man with a grey beard and a laptop. None of these sights are any different than I might see in any coffee shop in Kansas City. But the air: Oh, the air! It comes down from the mountains in rolling, gentle wafts, and my lungs have never felt so clean. The house fills with the rumble of thunder and the fragrance of a light rain. Soon lightening will slash the sky and the water will fall in magnificent sheaves, slashing the air, crashing on my deck. I stand in the doorway and watch the blackness descend on the morning, mesmerized by the summer storm. But the warm air flows into the house, and I close the door against its onslaught. I have read the paper, searching for news, trying to understand the strange graphics employed by the local editors to denote their reaction to the Republican primary candidates. I let my eyes wander down the obituaries, thinking my terrible thoughts about my own death and the loneliness which will permeate any words written about me. Now I'm sitting at my secretary, with my crystal mug of coffee beside me, thinking about storms, thinking about houses in which I've lived and the sound of rain on their roofs. Our house in Jasper, Arkansas had a flat roof on the porch above the garage. My husband traveled, leaving me alone with the stares of the townfolks and their small-town southern wariness. I'd sleep on the bed that we kept for visitors out on the screen porch. In early spring, rain peppered the back of our house, dancing, wild. Beneath our property, the Buffalo River rose in its banks as the season advanced. I could hear the river cutting through the valley. I listened to the urgent call of the birds and the rapid advance of small animals through the undergrowth. When the night sounds settled, I'd rise and move to a rocking chair, with my journal beside me and pen in hand. I'd scribble my terrible poetry and snippets of stories. I'd stare through the gloom, through the tall cedars, straining to find the stars when the rain cleared. In the morning, I'd drive to the mountain communities where my husband's friends lived. I'd sit in the women's kitchens and listen to their talk of babies, gardens, quilting, and survival. I'd walk around their yards and look at the rows of lettuce, standing over their stooped forms, gazing at little bugs and listening to their talk of organic treatment for aphids. They didn't ask about me, about how I spent my time or what I had done before I came to Arkansas. But they brewed herbal tea and brought me plates of fruit, and let me linger when I know they had chores lying undone. My favorite couple lived in a house below the roadway. Pat and Carole: Pat -- sparse, angular, dark, and intense; Carole -- soft, round, with flowing ginger hair and a wide bosom. They opened their home to me every time I ventured out of Jasper, telling me that I could stay with them, showing me a trundle where I could sleep, letting me help make dinner. I would watch the rain from their kitchen falling onto the mountain, while Carole moved around the house singing. When we sat down at their table, they beamed at each other and me, bringing me into their love, including me. I felt like their daughter, or their sister. In some ways, I felt like their pet, something curious that fascinated them. I basked in the attention. But even they didn't ask much about my life. I rarely talked about myself to any of those folks, down in Arkansas. I would stand at their windows, mesmerized by the rain, by the untamed vegetation of the mountain spring, while they chattered, and cooked, and folded laundry. Their stories would engulf me, like the rise of the river over its rocky banks. Their words wove themselves into my being. Now the memories of their faces have faded. But I still have their stories to sustain me, as I stand on my porch, in the rain, wondering what will become of me. Shadows score the driveway's service. From where I sit, the alternating dark and light spanning my yard and the neighboring lawns seems ominous. Birds chatter high in the maple and the sun rises to my right, scattering the pillars of gloom as its glow expands. I like my neighborhood because it reminds me of Jennings, the town in North St. Louis County in which I spent my childhood. It's different now, I know; but then its streets were only a decade old, paving sections of farm sold for those early subdivisions. My parents bought the old farmhouse, while its owner occupied a red-brick one-story to the south. Our porch faced west towards the post-war ranch homes flanking the street running from ours to the majesty of the shopping mall at the other end of Kinamore Drive. I would sit in a metal lawn chair, my feet on the low brick wall in front of me, my reveries interrupted only occasionally by a slow-passing car. I close my eyes and I am there, I am fifteen, I am home. Mother comes out from the house and sits to my right. She sets an aluminum glass on the flat surface of the porch wall. Mom's hair has been rolled around brush rollers, secured with plastic stickpins, tied round with a bandanna. She wears a wrap-around skirt, one of many she made from the same pattern. The summer heat settles on the yard as evening wanes. I've been writing in a notebook but it now lies on the concrete floor of the porch. Mother speaks, What are you doing, she asks, and I turn my head towards her. Nothing, I say. She nods. We like doing nothing, my mother and I. We rarely get the chance. In a month I will start my second year of high school. The summer still creeps slowly; the press of Labor Day does not yet loom. I've been babysitting the Tobin children while their parents work at the restaurant they own in the city and scribbling my poems and stories. Only half of the family remains at home. Ann has gone to the Army; Adrienne finally got an apartment near the zoo; Joyce got married. It's me and the boys now. Mother and I don't speak much. She drinks her lemonade and I gaze across the yard to the sycamore on the edge of the property near the street. Mother says, finally, Is something bothering you, and I tell her, It's so quiet. She nods. She knows what I mean. The silence which cannot be trusted. My father has been gone for months. She does not know where; she does not know how. She's tried to find out, in the sick way that a child picks at his scabs. She won't let herself heal, won't rest in the lull or move out of the way for good. She stands in the center of the street, stretching her neck, straining to see if the bulldozer has swung round to return. I feel the same. I'm thinking of joining Junior Achievement next year, I confide. My mother's thin eyebrows raise. She wonders aloud if that's a good idea. She asks about meetings. I tell her about the mailing which had come that day, for entering sophomores, addressed to me. I reach down to my notebook and slip the pages of the letter from between its covers and show it to my mother. She checks for the cost, the meeting place, the parental involvement requirements. Any of these could derail my plan. I'll get a ride, I assure her. My voice starts weak but I gather myself and forge ahead. I won't be the only one from Corpus Christi, I plead. Somebody can take me. Maybe Patty Becnel, I guess, though Patty has too many responsibilities already, with her father being widowed and her little brother being so young. I turn sixteen in the fall but won't take Driver's Ed until the following summer and so I will not be able to drive myself with my mother's car. But I want this. It's supposed to be good for college applications. And in that quiet summer, with my father gone, I've begun to think about having what I've come to learn is a normal life. I might have pajama parties. I might get a full night's sleep without the terrible interruption of my father's arrival, late, angry, drunk. The shadows might dissipate from under my mother's eyes. The sun has fallen below the neighborhood. Our house on McLaran Avenue, at the bottom of Kinamore Drive, sits in darkness. Lightening bugs begin to cavort in the grass. Crickets rise their evensong. The occasional chirp of the robins settling for the night sounds from tree limb to tree limb. My mother takes sips of watery lemonade. We'll see, she finally says. I know I cannot expect more. By the first snow, on Halloween, my father will have returned. He will have crashed through the door while I am at Junior Achievement, making trouble lights with my group which we will sell for five dollars to our aunts and uncles. He will have smashed a coffee cup over my mother's head and my sister Joyce will have brought her husband into the house to try to tame him. The police will have been called. The boy on whom I have, by then, developed a crush, will bring me home in the light dusting of snow because my mother has inexplicably failed to appear to retrieve me. My little brother will run out and give me a locked file box in which my mother stashed her wallet and car keys to hide them from my father. As I sit, stumbling over an explanation, a patrol car will pull to the curb in front of our house, at the bottom of the Kinamore Drive hill, on McLaran Avenue, in Jennings, Missouri, where my innocence was lost long before that wintry Halloween.